Let me start by saying this is not a recipe I created but one from Nourishing Flourishing, a blog that no longer exists. This is a recipe I started making about 5 years ago as I began to explore the world of paleo and alternative baking. I was trying new and different recipes for the people in my life with food intolerances or health issues and I fell in LOVE with this one. I have it printed out but recently went to try and find the original blog only to find that IT NO LONGER EXISTS. I could not find Nourishing Flourishing anywhere. I used to simply send people the link when they asked for the recipe, but now that it is no longer there I am sharing it here because this recipe is too good not to share with the world. 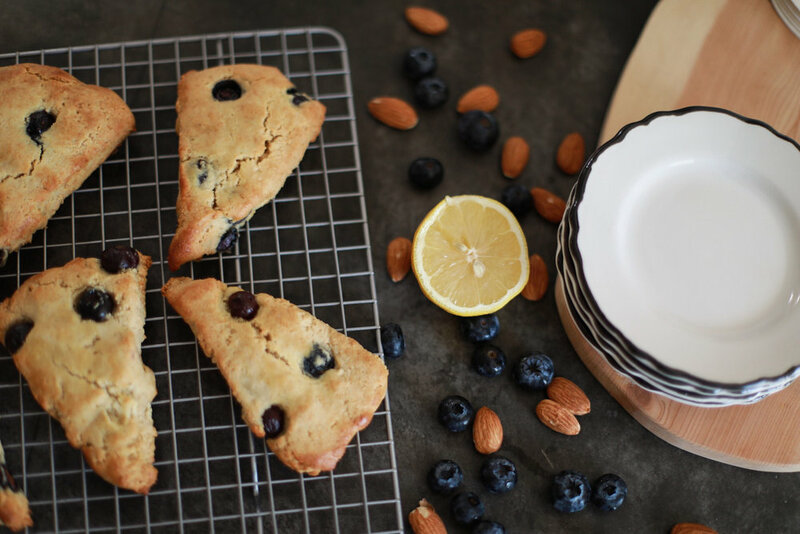 I made a few minor changes to the original recipe, including adding more lemon because I love a lemon and blueberry duo something fierce! I could make and enjoy these constantly. I love the zesty lemon and pop of blueberry. 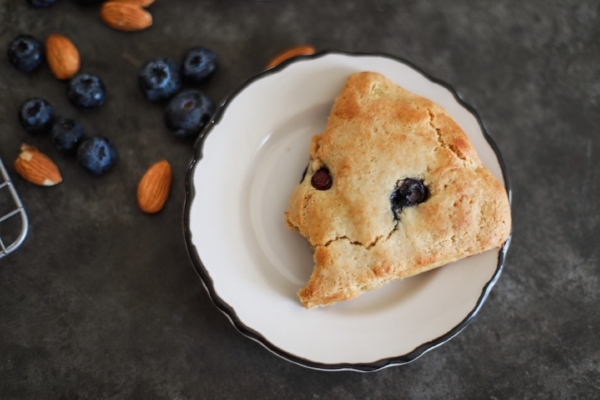 These are made with paleo flours, so are not the same texture as a traditional scone. It is a bit softer, like a muffin. But they are absolutely scrumptious. I love to serve them for brunches or parties, and make them on a Sunday to pull out of the fridge and enjoy with a cup of coffee for a quick breakfast that feels like an indulgent treat but is definitely healthier. 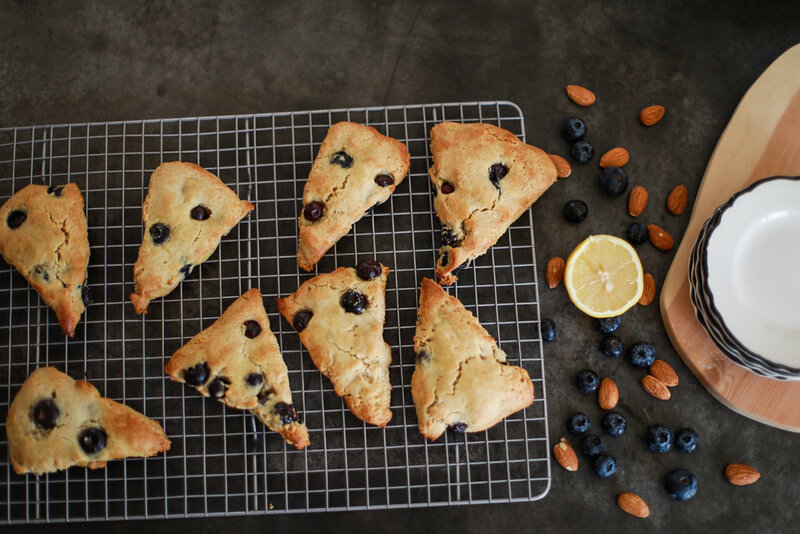 Do yourself a favor and make these scones. And I’ll update this if I ever find that the original blog comes back to life! Preheat the oven to 350 degrees F, line baking sheet with parchment paper. Mix all the dry ingredients together in a bowl and stir with whisk or fork. Stir the wet ingredients (everything except the blueberries) together in separate medium bowl. Stir in the dry ingredients to mix. Add the blueberries and combine gently, making sure not to crush the berries. Wet your hands and gather the dough into a ball and place on parchment paper-lined baking sheet. roll or pat the ball out into a circle, about 3/4” thick. Carefully slice into 8 wedges and separate from touching one another so they are able to bake evenly. Place the baking sheet in oven for about 15 minutes, or until the edges and top starts to brown. Let it cool on cooling rack. Store in airtight container in fridge.